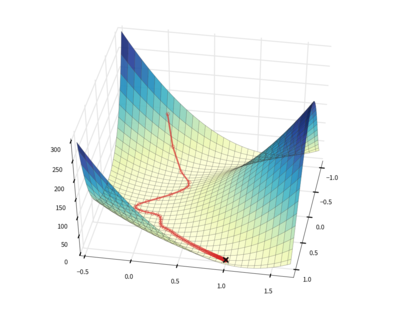 The downhill package provides algorithms for minimizing scalar loss functions that are defined using Theano. All algorithms permit the use of regular or Nesterov-style momentum as well. The source code for downhill lives at http://github.com/lmjohns3/downhill, the documentation lives at http://downhill.readthedocs.org, and announcements and discussion happen on the mailing list. where the first term represents the approximation error, the second represents the sparsity of the representation, and the third prevents the basis vectors from growing too large. # Set up a matrix factorization problem to optimize. # Minimize the regularized loss with respect to a data matrix. batch_size=A,                 # Process y as a single batch. max_gradient_norm=1,          # Prevent gradient explosion! monitors=(('err', e.mean()),  # Monitor during optimization. # Print out the optimized coefficients u and basis v.
© 2015, Leif Johnson. Created using Sphinx 1.3.1 with the better theme.